Spanish Fork was settled in 1857. The first flour mill was built by Archibald Gardner in 1858-59. The water for the mill came from the Spanish Fork River. The stream was enlarged to give sufficient power to run the mill. This mill was constructed of rough lumber. The grinding was accomplished by large round granite stone burrs about four feet in diameter and two feet thick. These stones had grooves running across them; the lower stones remained stationary while the upper one rotated. The wheat came to the center of the burrs through a wooden chute. The husks of the kernels of wheat, when separated, were called bran; the next finer are the shorts; and the finest made of flour. The burrs frequently had to be dressed to keep them in good operating condition. 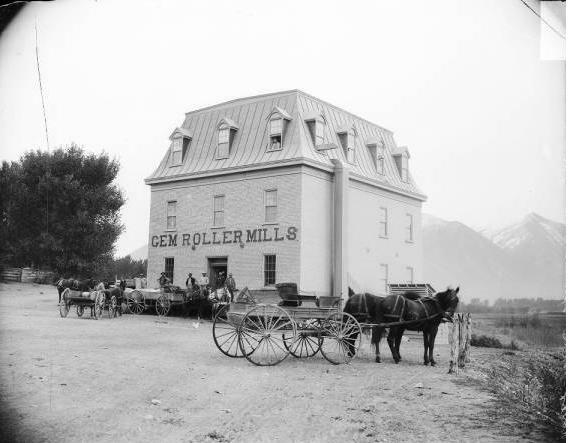 Gardner sold the mill to the Spanish Fork Co-op in 1874. Shortly after it was torn down, it was replaced by a larger, two-story building with more advanced equipment. This mill was built of shiplap lumber with gables facing north and south. The flumes carried water to the mill wheel, with a fall of twenty feet. Flour was made in the mill for fourteen years until April 15, 1888, when it burned to the ground, probably from spontaneous combustion. Within a short time, a four-story brick building was started at a cost of $40,000. New machinery was installed, and large steel rollers replaced stone burrs. The new mill burned in December 1927. It was never rebuilt. Today nothing remains of the once busy whirring mill. 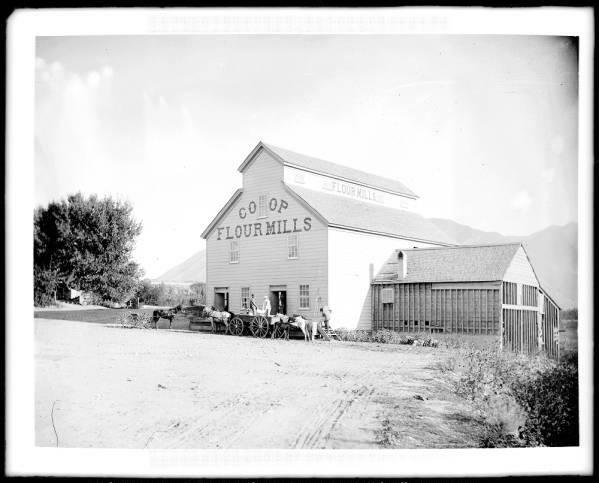 I don’t see any remains of the old mills, I think the fairgrounds ate them up, but here are a couple photos courtesy of the L. Tom Perry Special Collections, Brigham Young University. Visit my list of places in Utah or list of DUP markers.